Cartilage piercings are amongst the most popular types of piercings. Not only does it look cool, it also makes the wearer feel empowered and strong. The cartilage can be found all throughout the body, including the nose and ears. It is a flexible tissue that can be found everywhere in the body, which is what makes it a good choice for piercings. There are lots of things that you should know before getting a cartilage piercing done and today, we will discuss what those things are. 1 What is a Cartilage Piercing? 2 What are the Different Types of Cartilage Piercings? 3 How Much does a Cartilage Piercing Hurt? 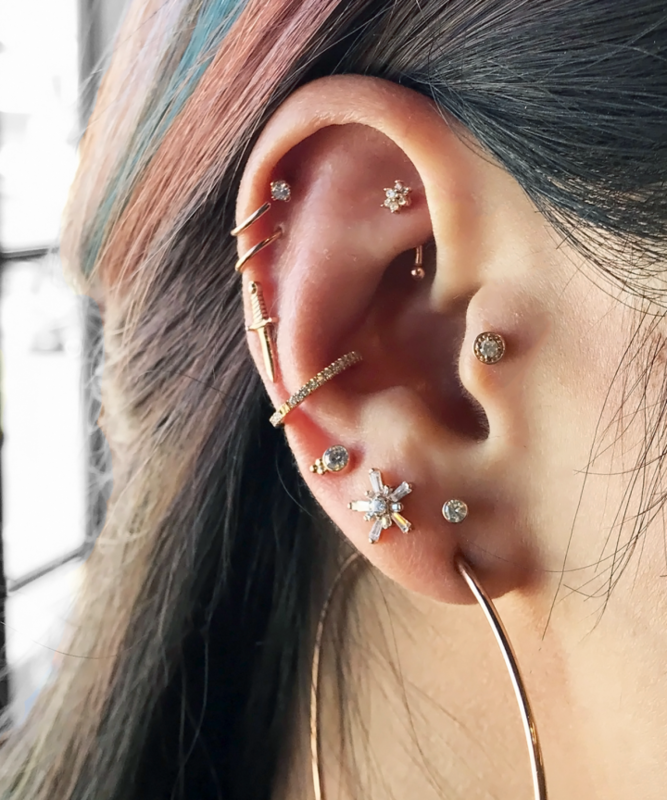 4 What Should I Expect when Getting a Cartilage Piercing? 5 Until when will my Piercing Hurt? 6 What Should I Do to Lessen the Piercing Pain? 8 What Should I Do if I Contract an Infection? 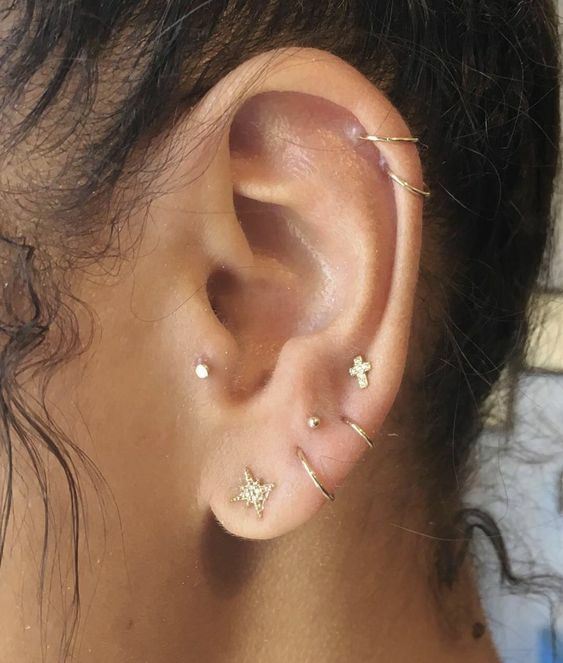 9 How Much does a Cartilage Piercing Cost? 10 How Should I Clean my Cartilage Piercing? A cartilage piercing is a hole made through any body part that has a cartilage in it. 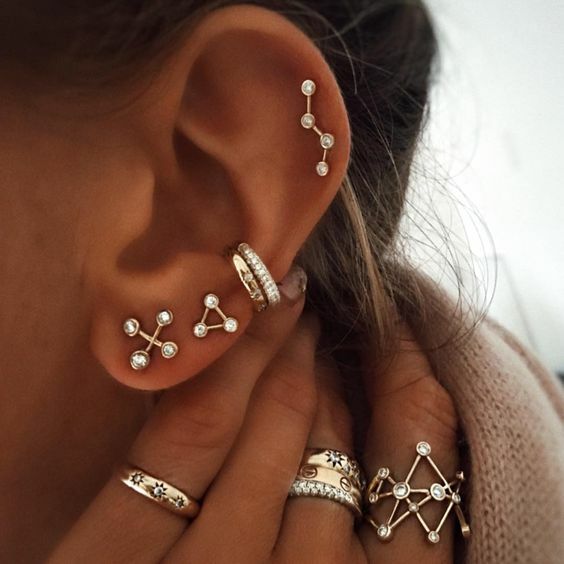 You can either choose to have a symmetrical cartilage piercing or just on one ear or part of your nose. Wherever you decide to put it on your body, you have to make sure that everything will go well. 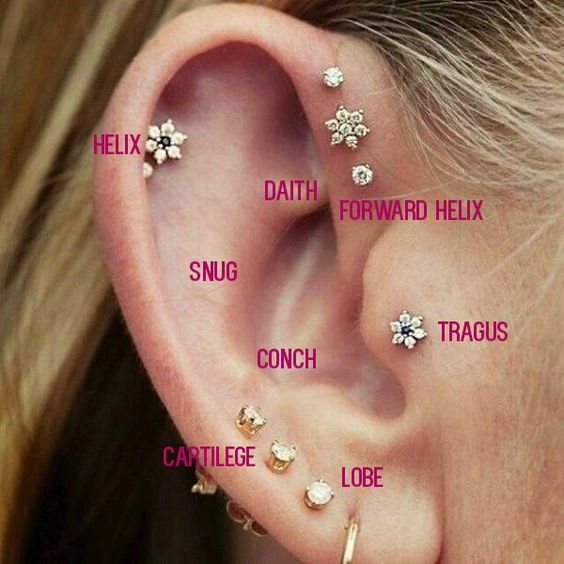 What are the Different Types of Cartilage Piercings? 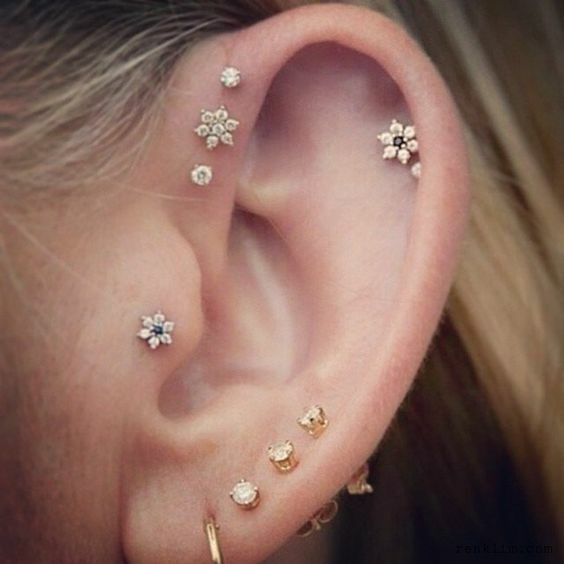 There are a couple different types of cartilage piercings and today, we are going to discuss what those are. The helix piercing is usually located on the topmost portion of the ear. The jewelry can either be a stud or a ring, depending on what you personally prefer. This type of piercing should be done free-hand by the piercer, rather than using a piercing gun. Piercing guns are most likely to cause an infection, which of course, you would want to avoid. The tragus piercing is done on the cartilage that is protruding from the inside of the ear or in front of the ear canal. This type of piercing is quite popular, as the pain is usually pretty tolerable for most people. The nerve endings in that specific area is very limited, which makes the piercing tolerable and a little bit more pleasant compared to others. 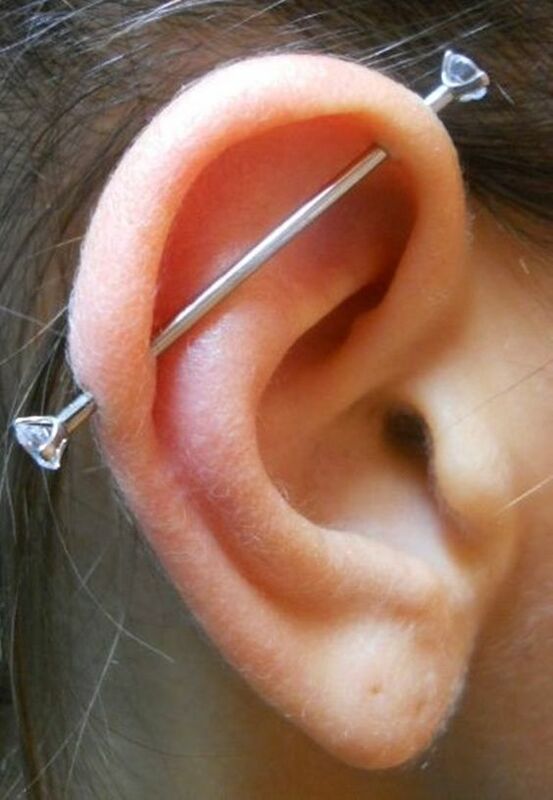 An industrial piercing is usually done on the top portion of the ear. 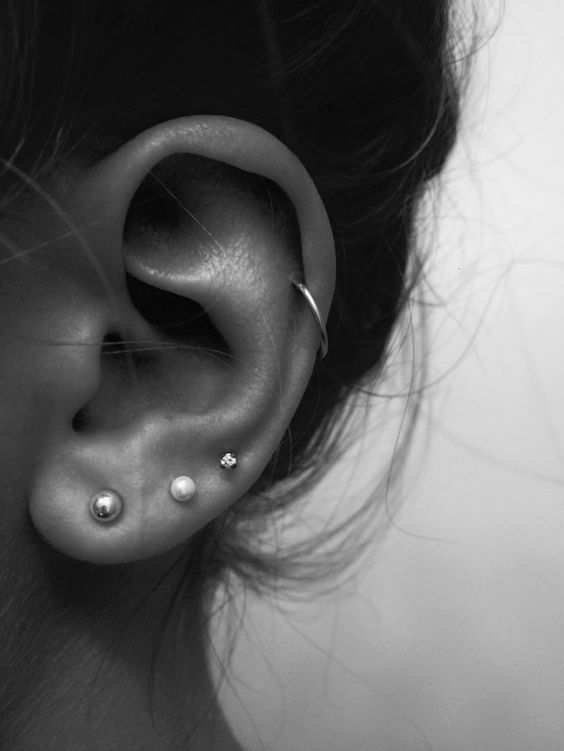 The cartilage is pierced twice, in which a barrel-type earring is usually inserted on one end and exits on the other end. 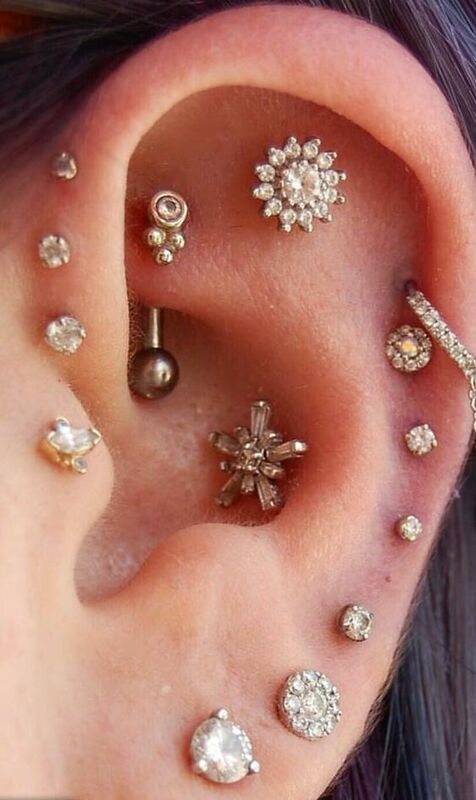 For this type of piercing, the most commonly used earring is a 14-gauge barbell, although a 16-gauge is also usually considered. Once the piercing has completely healed, it usually is replaced with a barbell. 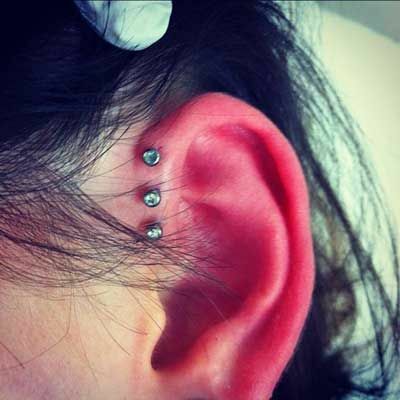 The antihelix or snug piercing is exactly what it is called – a piercing that is opposite to the helix piercing. It is located in the inner cartilage and has a shallow opening compared to other piercing locations on the ear. Rings and curved barbells are usually used for this piercing, as the location cannot accommodate huge earrings. 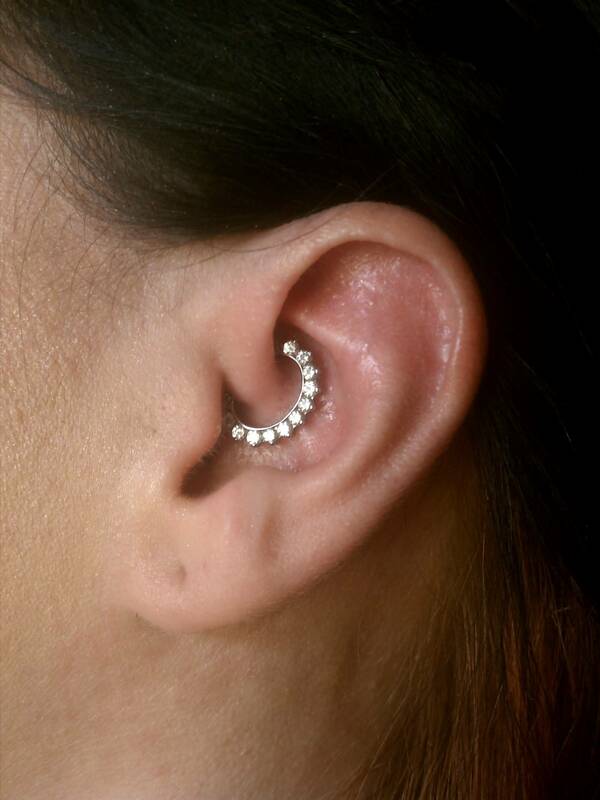 The daith piercing is located on the inner cartilage of the ear. 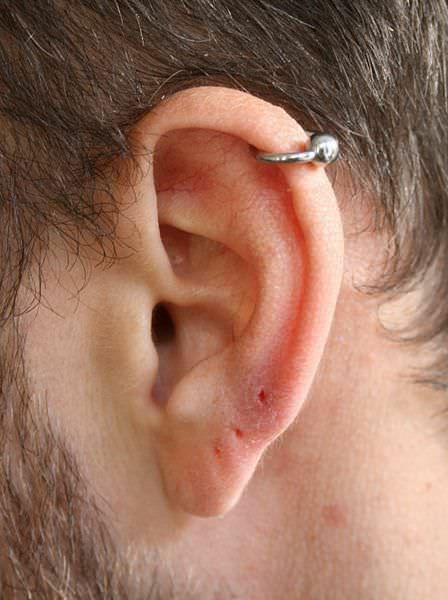 Piercers usually use a curved needle to avoid puncturing and damaging the cartilage and its surroundings. For the jewelry, a captive bead ring or CBR is usually used for an easier and less painful insertion. 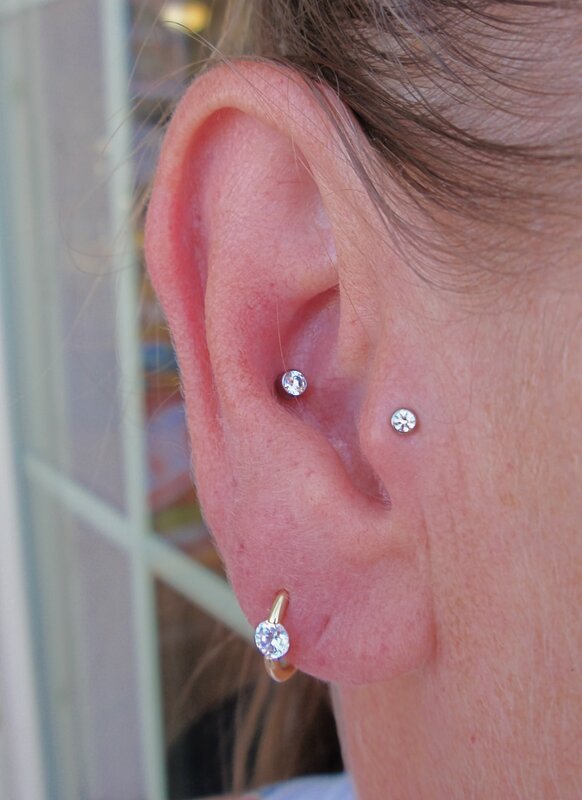 The anti-tragus piercing is located on the lower cartilage of the ear, near the earlobe. The jewelry used is usually a captive bead ring or a small gauge stud, as this location can only accommodate small pieces of jewelry. The anti-tragus heals longer than usual cartilage piercings and can take up to a year to completely heal. Make sure to take good care of it for it to heal properly. 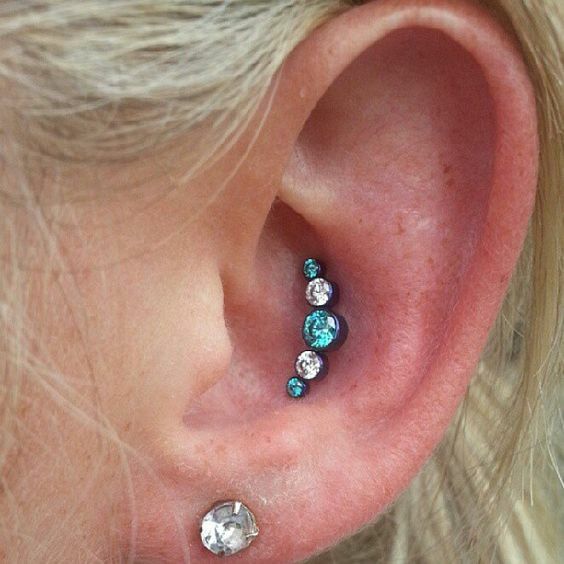 The conch piercing is located exactly in the middle part of the ear, where the cartilage is thick and tough. Because of this, the conch piercing can take up to 18 months to heal completely. When it comes to the jewelry, the conch can house different types of jewelry such as the barbell. Captive bead rings, and the most common one, studs. 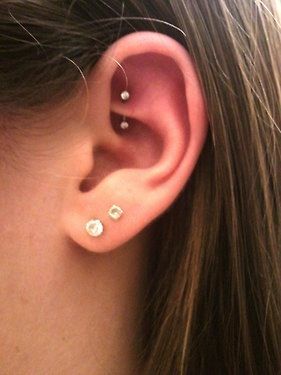 The rook piercing is located on the innermost portion of the ear cartilage. It is one of the most painful ear piercing locations, so make sure that you can handle it before proceeding with getting one. 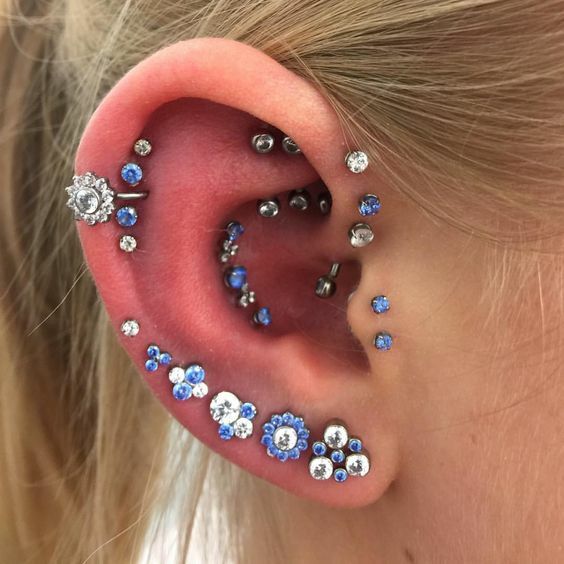 This is due to the hundreds and thousands of nerve endings located on that part of ear cartilage, as well as the varying layers of cartilage that must be pierced. For the jewelry, a captive bead ring or a curved barbell should be used. The forward helix piercing is located on the uppermost part of the ear. 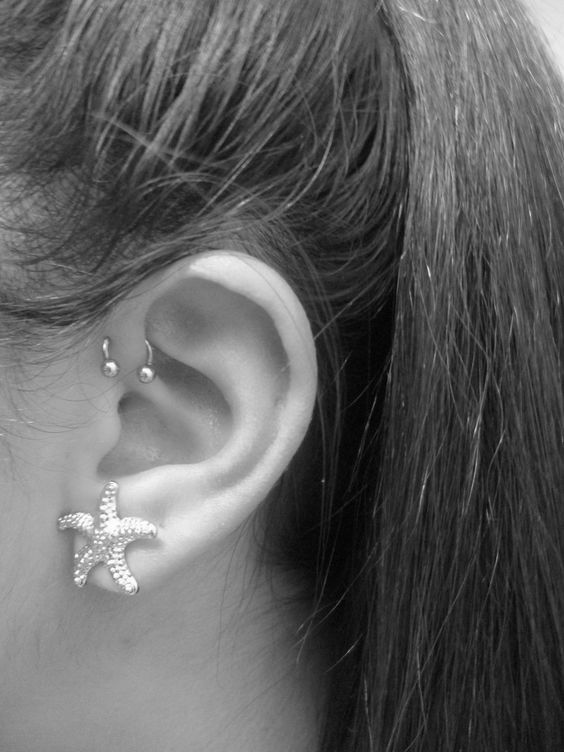 It is placed opposite of the helix piercing, on the innermost part of the ear. 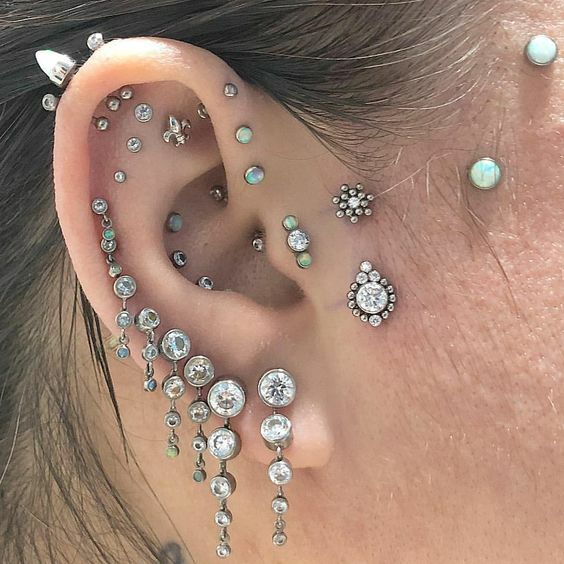 The body jewelry to be used are captive bead rings or studs, whichever the person to be pierced prefers. Every type of piercing will hurt, no matter where it is located. The same can be said for cartilage piercings since the piercer will be puncturing a hard and solid area of the ear. However, the pain all depends on the one being pierced. If you have a high tolerance for pain, then you probably can take any cartilage piercing. If you cannot handle the pain that well, then you can expect the pain to be a little bit more intense. When it comes to piercings though, the initial pain is usually over in just a couple of minutes, even seconds. You would just have to endure the pain caused by the needle, the pain after the piercing is completely different. For the pain after the piercing, you would have to expect a throbbing type of pain. This can last for about a day or two and if it persists, then you’d better let your piercer know. The area will also feel tender and sensitive, so make sure to avoid touching the pierced area while it is still in its healing period. What Should I Expect when Getting a Cartilage Piercing? The first thing that the piercer would do is to explain the process to you. They will explain which tool they will use – either a gun or a needle. Take note though, that a hollow needle is better than a gun when it comes to cartilage and ear piercings. The pain is actually more tolerable, plus, hollow needles are less likely to cause an infection than a piercing gun. Next, you can expect the piercer to have you sit down on the piercing chair. They will then sanitize the needle or gun to be used, as well as the jewelry that you prefer. After that, they will ask you if you are ready for the procedure. They will then expect you to sit still while the hollow needle or piercing gun creates a hole in your cartilage. After this, they will talk to you about the aftercare instructions, so listen well and take down notes if you have to. Until when will my Piercing Hurt? Just like what we have mentioned earlier, the actual piercing will cause a sharp pain for just about a couple of seconds. The throbbing and tenderness can last for about a week or so, especially since the cartilage does not get that much blood flow. Unlike a tattoo, piercings won’t hurt for a long time. If the pain persists for more than a week, then go ahead and visit your doctor, as this might mean that an infection is building up in the area. What Should I Do to Lessen the Piercing Pain? Luckily for you, there are a couple of things that you can do to lessen the cartilage piercing pain. Continue reading below to know what they are. Make sure you get lots of rest and sleep before going in for any type of piercing, as the procedure can take a toll on your body. If you don’t, the likelihood of you getting nauseous is very high, as your body will treat the piercing as a small trauma. The body needs ample rest and should be a hundred percent healthy when undergoing a process such as a piercing. Make sure that you are not currently sick when getting the piercing done, as the body heals better when it is a hundred percent healthy. If you happen to be sick during your appointment, then better call your piercer and have the appointment or booking rescheduled once you have completely healed. Alcohol is a known blood thinner, which is why you would have to avoid it when getting a piercing done. Your piercing will most likely bleed more if you drank alcohol or took drugs the day before your piercing, so make sure to steer clear of both at least before you get your cartilage piercing. The skills of your piercer will also affect the piercing pain. Make sure to do your research to see which piercers are well-known and trusted around your area. Remember: your safety comes first, the cost only comes in second. 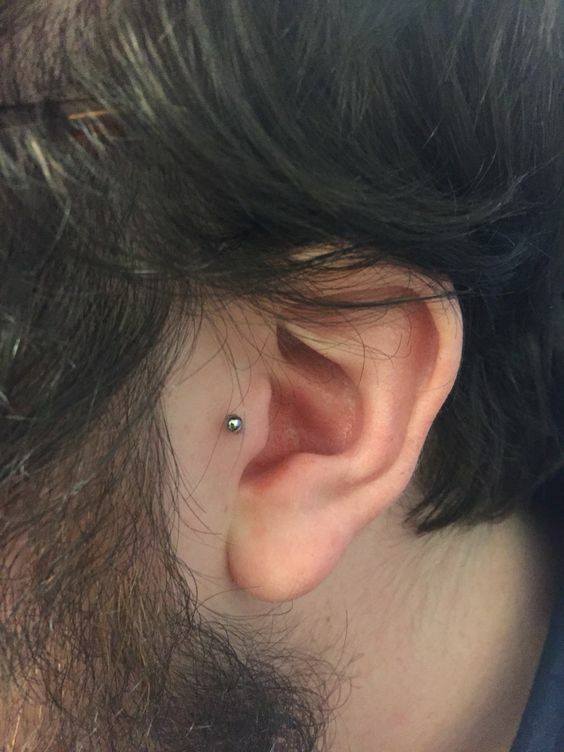 If you feel like you really cannot stand the pain, then go ahead and ask your piercer if they can use a numbing cream on the area that is about to be pierced. The piercer will rub the numbing cream on the area that will be pierced. They will leave it on for at least 30 minutes to let the numbing cream sink in. However, you can still expect a little bit of tingling sensation in the area that will be pierced, but the pain will be much less than expected. Any type of wound can be infected, especially if it is not well taken care of. The same goes with a piercing – you would have to be very careful with it, especially if it is it new. Read on below to know the risks of getting a cartilage piercing, as well as the symptoms that you would have to watch out for. During the healing period, your piercing wound is still open, which means that bacteria can easily enter the opening. To avoid getting an infection, make sure to follow the aftercare instructions given by your piercer. Always clean it with a sea salt solution at least twice per day to make sure that you won’t contract any infection during the healing process. Infected cartilage piercings can spread to the whole area and the cartilage itself, leaving it very difficult to treat. To avoid getting an infection on your new cartilage piercing, make sure you educate yourself with the risks so you would know how to avoid them. The first thing that you would have to check is the cleanliness and sanitation of the area that you would get your piercing from. Always look and ask if they sterilize and replace their tools, most especially the hollow needle. If they prefer using a piercing gun, then this should be sanitized as well. The piercer should also use a pair of gloves before doing the piercing on you. Also, they should clean their hands and have an antibacterial sanitizer or alcohol on hand. Always remember this tip: avoid touching the newly pierced area, as your hands are almost always clad with bacteria. If you have to touch it, then always clean and wash your hands before doing so. Always listen to your piercer’s aftercare instructions and follow them to a T. Always keep your pierced area clean so you can avoid harbouring some type of bacteria. Clean your piercing twice to thrice a day with a sea salt solution, or whichever your piercer advice you to use. Before getting pierced, go to your trusted doctor and get yourself tested for any type of allergies, especially with metals. Nickel is usually the most common irritant when it comes to jewelry, so make sure to avoid anything with nickel. It would be wiser and better to use a jewelry with higher quality than get some type of infection. Always watch out for these common symptoms that can be found in infected piercings. The number one sign that you should watch out for are redness and tenderness around your new piercing. These are both normal during the first few days after getting your piercing, but if it persists for more than a week, then you should start to get worried and visit your doctor ASAP. If you notice pus or blood coming out of your piercing, especially if it’s days after getting it, then chances are you have an infection. These two are signs of an infection, especially if it is accompanied by a fever. If you notice your piercing bleeding or you see pus coming out of it, then go ahead and call your doctor. No matter how high or low the fever is, chances are if you get one after getting a piercing, then that means that you have some type of bacterial infection. The fever will usually come with pus discharge and/or bleeding, so make sure to watch out for that, too. What Should I Do if I Contract an Infection? The first thing that you must do when you notice these symptoms is to go to the emergency room or your trusted doctor. However, you can follow these tips below to make sure your infection won’t make a turn for the worse. Use a warm compress on the pierced area, especially if it is currently inflamed. Make sure that the warm compress is not too hot before using it on the infected area, as using something that is too hot can only increase the pain that you are feeling. Using a warm compress can help decrease the inflammation and can help minimize the pain temporarily. Ask your doctor or piercer what brand or type of antibacterial spray you can use to get rid of the infection temporarily. Get the ones that are over the counter, but make sure that it is approved by your medical practitioner. Avoid taking oral antibiotics without the advice of your doctor, as this can be very dangerous. Just like what we have said earlier, the number one thing that you should do when you notice that you have these symptoms is to go to the emergency room. Your doctor will tell you what to do and will give you the right medicines that you should take to make the infection go away. How Much does a Cartilage Piercing Cost? There are lots of different types of cartilage piercings, which means that the price range will be a lot different, too. You can expect the price range to be at around $40 – $50 though. 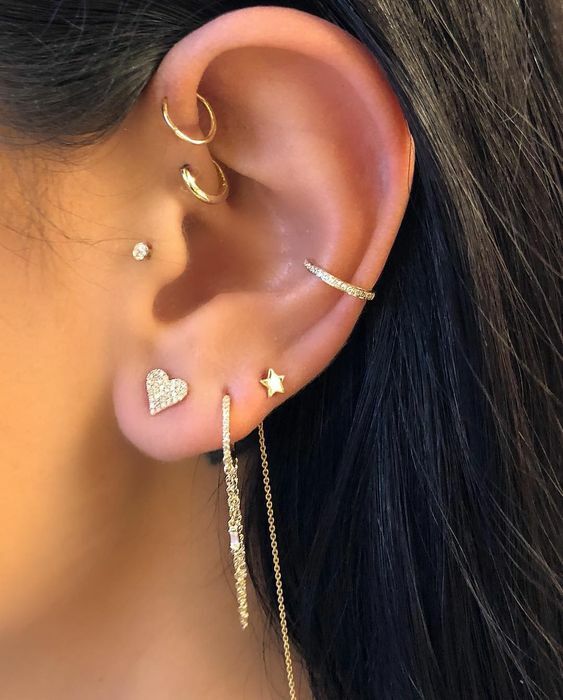 There are different factors that you would have to consider including the reputation of the piercer, the quality of the jewelry, and even the location of the shop that you are getting the piercing from. Always remember: your safety and the quality of piercing comes first, the cost only comes in second. How Should I Clean my Cartilage Piercing? The most common cleanser and disinfectant that piercers will advice you to use is a saline solution. All you have to do to get this mixture is to get a couple of tablespoons of sea salt and mix it with warm water. Mix it with a spoon until the sea salt has completely dissolved in the water. Once this is done, you can then grab a clean cotton ball, dip it in the mixture, and press firmly on the pierced area. Let the cotton ball and sea salt mixture stay on your piercing for about 3 – 5 minutes and let it sink in for a thoroughly clean piercing.